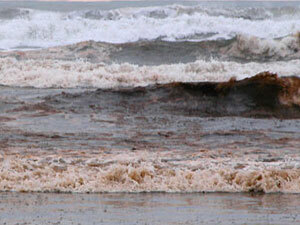 Oregon’s Harmful Algal Bloom monitoring (MOCHA) project existed from 2005 to 2012. 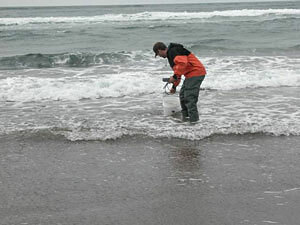 After a 2005 coast wide shellfish harvesting closure due to Domoic Acid (DA), ODFW requested rapid response funding from the NOAA Center for Sponsored Coastal Ocean Research (CSCOR) that enabled Oregon to initiate a monitoring program similar to Washington State’s ORHAB (Olympic Region Harmful Algal Bloom) project. In 2006, ODFW in collaboration with Oregon State university, University of Oregon and the NOAA Northwest Fisheries Science Center were awarded a 5 year nearly $2.3 million competitive grant from the NOAA CSCOR Monitoring and Event Response for Harmful Algal Bloom (MERHAB) research program to develop an integrated harmful algal bloom (HAB) monitoring and event response program. This program, MOCHA, begun collecting data in 2007. ODFW staff, in conjunction with Oregon Department of Agriculture monitored 10 sites along the coast of Oregon for any potential signs of the phytoplankton that cause Domoic Acid (Pseudo-nitzschia sp.) 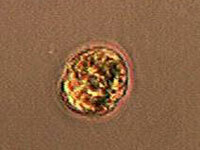 and Paralytic Shellfish Poisoning (Alexandrium sp.). 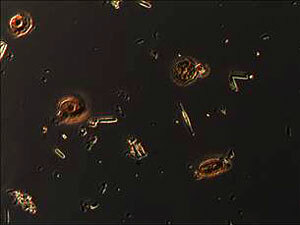 Phytoplankton is a primary producer responsible for approximately 90% of earth’s oxygen production. 1) Whole Water Sample- This sample is taken from the surf using a five gallon bucket to first collect the water. After the sand settles a small 8 oz sample jar is filled. A temperature and salinity reading is taken, the jar is labeled and prepared to be sent back to the lab for analysis. 2) Net Tow Sample- This sample is taken using a phytoplankton net to concentrate what plankton are in the water. The net is made of a selective material allowing the sea water to escape while trapping the phytoplankton. The net can either be towed through the surf for a short amount of time or the sampler may pour a bucket or two of water through the top end to collect the sample. The sample is then placed in a container, labeled and sent to the lab. Back at the lab, internationally trained staff receives and prepares the samples for analysis. Using a light microscope, concentrated samples are viewed to determine the presence of Pseudo-nitzschia sp. and Alexandrium sp. This gives staff a quick idea of what phytoplankton is abundant along the coast. Staff then tests the whole water samples using a 0.1 ml nano-plankton chamber. 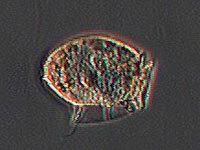 Any Pseudo-nitzschia sp., Alexandrium sp. or other variety of phytoplankton are recorded and quantified. The results are then checked against acceptable levels that were developed by the ORHAB project and action is taken if necessary.